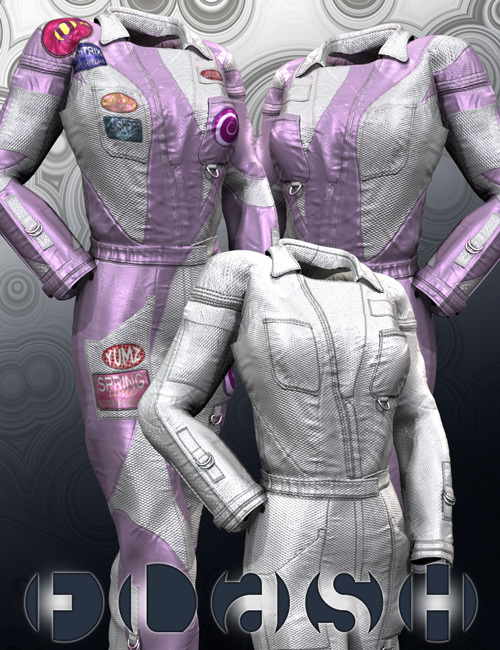 This is a texture add-on set for our WELDER GIRL clothing set. Once the desired item is in your scene (for example, the welder jumpsuit), be sure it is selected/current. Once the desired item is in your scene (for wxample, the welder jumpsuit), be sure it is selected/current. Navigate to ….Runtime\libraries\Pose\WelderGirl\WelderGirlFLASH… in your content library, and double click on the desired texture thumbnail. This product makes extensive use of displacement maps for bends and wrinkles and other clth characteristics. For best results make sure that 'Displacement use' is turned on in your render settings. The textures we included are very high detail. Their main purpose is to offer nice detail in close-up and high resolution renders. They may not perform as well in mass scenes or more complex animatios, and they are likely to use up significant part of resources. More advanced users may resort to resizing textures contained in ….Runtime\Textures\BKCFlash and …Runtime\Textures\Surreality\Clo\WUnder folders to a more suitable resolution. For example, from 4000×4000 resolution to 1024×1024 or some other desired size. This can be done in most image editing proghrams. If doing this. ALWAYS be sure to save a backup copy of your original images. If the original images get overwritten, one may need to re-download and reinstall the product. All materials/shaders are made to perform under a medium intensity white/neutrallight. As is usual in 3d applications, for more refined results, material settings may need to be adjusted to be in harmony with other elements in the scene (lighting, other objects and materials). DAZ Studio Users, if you are not using IBL based lighting or uber environment, and the rendered textures are looking 'too shinny' you may need to lower the specular intensity setting in the advanced material settings. This may be applicable to Poser users, but to a lesser degree. Delete .dsb or .dsa files from the ….Runtime\libraries\Pose\WelderGirl\WelderGirlFLASH… directory. This will leave you with Plain Poser .pz2 files which will load the textures, in a normal DAZ Studio fashion. Specularity, bump, displacement and other material settings need to be optimized manually. It's not perfect, but it helps some. Material Pose files are located in ….Runtime\libraries\Pose\WelderGirl\WelderGirlFLASH. Both, Poser and DAZ Studio users are meant to use the same library and thumbnail locations. Each of the programs is capable of automatically detecting the correct file to load. Please see readme file included with the product for a full file list.